A timeless kitchen looks incredible for many years to come, while a trendy kitchen clearly shows its age over time. Some styles border timeless and trendy, for instance the all-white kitchen look. People love to call this look ‘timeless’ because white never goes out of style, but eventually all-white kitchens are going to be “so 2017.” That doesn’t mean you should skip out on the white cabinets and light-colored countertops, just be careful going overboard with any one trend or else you risk branching from timeless to trendy. What is considered timeless today might not be so timeless 30 years from now, but at that point it’ll be time to swap out cabinets or at least cover them in a fresh coat of paint. The goal is to avoid overly trendy kitchen features as well as any trends that are on their way out; these features will show your kitchen’s age 5-10 years from now, when you should still be enjoying your kitchen and not dreaming of a remodel. This has been a popular trend for years—and continues to be a popular choice for remodels. The only problem? It’s a trend that’s well on its way out. High-end kitchens are opting for more discreet locations to store the microwave, like pull out cabinets. Instead of a microwave, it’s more common for people to install a full range hood over the stovetop. Pot racks have been popular for years thanks to their functionality, but as kitchens move towards sleeker and more simplistic designs, the cluttered pot rack is starting to fall short. Plus, as many have discovered, as soon as your pots and pans are no longer brand new, they don’t look so great hanging up for all to see. Instead of pot racks, it’s becoming more common for people to install hanging lighting fixtures above their center island. The great thing about adding a pot rack is that it’s easy to remove when you’re over it—so in terms of trends, this isn’t a bad one to jump on if you really like it. Nothing screams the nineties like a kitchen desk. While they look nice and seem practical, very few people actually use kitchen desks—hence why they fell out of style. If you’re currently working with a kitchen desk, you might want to consider transforming it into coffee or wine bar, or even additional pantry space. 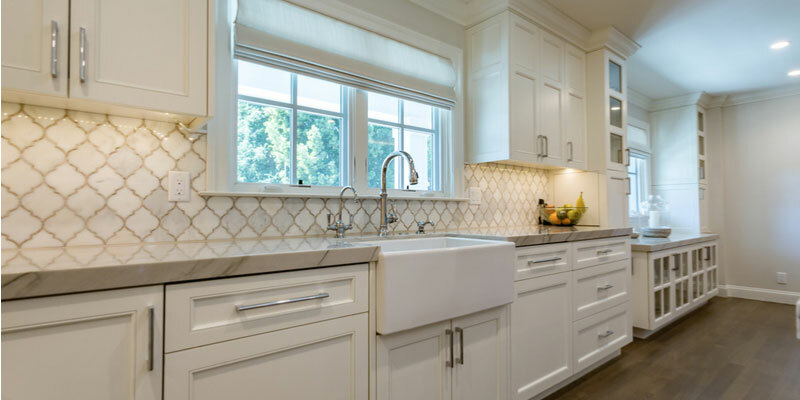 A farmhouse sink is so old school it can’t possibly go out of style—heck, it’s still in style today and it became popular before dishwashers! Plus, it adds practicality that never goes out of style. Speaking of functionality, great appliances are worth splurging on because they shouldn’t go out of style before they break down and need to be replaced. Especially if you stick with stainless steel or other neutral varieties. Nice wood cabinets are timeless and add so much value to your kitchen. It doesn’t matter what color you want today, you can always strip cabinets and add a new paint color or tint down the road. Check out our wide selection of quality wood cabinets at wholesale prices. Natural stone remains a popular surface for countertops because it’s incredibly durable and looks beautiful. Stick to colors that’ll match a variety of kitchen styles so you can change other elements of your kitchen throughout the years while still maintaining the same countertops. Check out our wide selection of quality granite at wholesale prices. The kitchen trends that are sure to go out of style are impractical trends that don’t add anything to your kitchen other than a certain look. On the other hand, timeless kitchen features offer benefits that have little to do with style or appearance, and their overall look can be changed without altering functionally; for instance, solid wood cabinets or farmhouse sinks.